140 starters and 121 classified finishers. 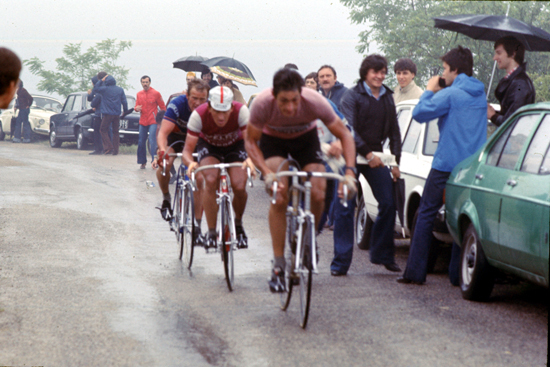 The 1977 Giro started as a race between two gifted time trialists, Freddy Maertens and Francesco Moser. When Maertens crashed with Rik van Linden on the Mugello speedway and was forced to abandon, Maertens' Flandria team made Michel Pollentier their team leader. Pollentier performed superbly, doing well in the high mountains and winning the final time trial. This was Pollentier's only Grand Tour win. Herman Van der Slagmolen s.t. Freddy Maertens broke his wrist in a crash during the sprint, forcing him to abandon. Miguel-Maria Lasa crossed the finish line first, but was declassified to third after being postive for dope. Wilmo Francioni is the stage winner. RCS Media Group purchased La Gazzetta dello Sport, the sports newspaper that owned the Giro d’Italia. In 1927 Angelo Rizzoli had started magazine publisher RCS, then named Rizzoli Editore. Over the decades Rizzoli’s firm grew and prospered, culminating in its 1974 purchase of Italy’s most important newspaper, Corriere della Sera, leading to the firm’s being renamed Rizzoli-Corriere della Sera (RCS). The company’s complicated financial history during the 1980s and 1990s—including involvement in a banking scandal that led to a 1982 bankruptcy—would make any green-eyeshade owner cross-eyed. The ultimate result is that RCS Media Group is now a hugely successful international enterprise owning magazines, newspapers, broadcasters and most important for bicycle racing, RCS Sport. This is the branch of the media behemoth that organizes the Giro as well as Milan–San Remo, Tour of Lombardy and other important Italian races. The Flandria squad brought Freddy Maertens, one of the most extraordinary riders in the history of the sport, to the 1977 Giro; extraordinary in that he won 54 races in 1976, including the World Road Championship and the points competition in the Tour, where he won eight stages. Maertens says that his 54 professional road wins is the greatest single-year total in cycling history, arguing that the 54 claimed for Merckx for 1971 is wrong because that number includes three track races. In 1977 Maertens would win 53 races, including Paris–Nice, the Vuelta (winning 13 stages in a flat edition that was probably designed for him), the Tour of Catalonia and Het Volk. Maertens possessed one of the finest sprints in the sport's history as well as a wonderful time trialing engine. He was formidable everywhere except in the high mountains. But trouble followed the gifted Belgian like a lost dog looking for a home. He earned disqualifications for doping in the 1974 Tour of Belgium and the 1977 Flèche Wallonne. Maertens’ positives didn’t occur with greater frequency than they did with other good Belgians of his era, but the opprobrium seemed to stick to him when others seemed to slough it off. For help in winning Giro stages Maertens brought along his good friend and loyal gregario Michel Pollentier, who would also become intimately acquainted with trouble. The short, powerful Belgian was one of the most styleless racers ever, but even with elbows out and knees flailing, he was a potent and feared rider. In 1976 he won the Tour of Belgium and was second in the Tour of Switzerland. Fine help indeed for Mr. Maertens. The age of Merckx and Gimondi had passed. After winning the Giro and Paris–Brussels in 1976, Gimondi would never again win a major race. The sport was owned by younger riders and the list of likely Giro winners included Baronchelli, Panizza, Battaglin, Bertoglio and the youngest of the racing Moser brothers, Francesco. This 3,968-kilometer edition started with a 7.5-kilometer prologue at Monte di Prócida, west of Naples, which Maertens won. Moser was only 3 seconds slower, with de Muynck at 21 seconds and Baronchelli at 25 seconds. The prologue times counted this year towards the General Classification. Maertens made it two in a row when he outsprinted the bunch in Avellino to win stage one. All the big men were clustered near the top of the standings with only a few seconds separating them, and it stayed this way day after day. Moser managed to gain a few seconds on Maertens and take over the lead, but by the end of the sixth stage at Gabbice Mare, the race was effectively unchanged. The gloves came off during the seventh stage with its climb to San Leo and the Rocca delle Caminate before finishing in Forlì. As they raced over the hills of Le Marche, the big guns boomed, causing a group of six riders to form off the front. Just as the peloton had been breaking up, de Muynck and Magniflex rider Alfio Vandi crashed. At the end of the stage Maertens led in Moser, Panizza, Pollentier, Baronchelli and de Witte while Gimondi, de Muynck and Battaglin lost 71 seconds. For them the day was short of being a catastrophe, but Bertoglio lost almost six minutes and Baronchelli more than eight. Maertens took his seventh stage win at Mugello in Tuscany. A second half-stage was held that afternoon on the Mugello motor raceway. Maertens thought the next day’s time trial would see him back in pink. It didn’t work out that way. He and Bianchi’s crash-prone sprinter Rik van Linden collided in the final meters of the Mugello circuit race. Their handlebars tangled while they were traveling more than 60 kilometers an hour, sending both of them to the ground and then Maertens to the hospital with a broken wrist. 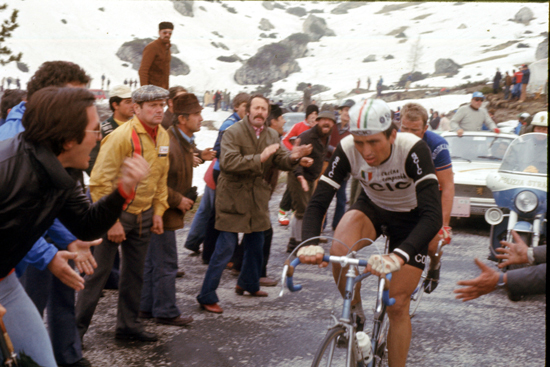 Maertens’ fabulous winning run was stopped cold. Flandria gregari Marc De Meyer and Pollentier thought it would be best to go home and perhaps prepare for the Tour. Flandria director Guillaume Driessens wanted to remain. Torriani agreed with Driessens and thought it would turn out well for the team if they hunted for stage wins and looked for a way to take advantage of the growing feud between Moser and Baronchelli. Flandria stayed, and with Maertens on his way home to Belgium, Pollentier was made team captain. The people who are paid to know about these things said that the race was now going to be between Moser and Baronchelli. The tifosi, and it’s fair enough to say the two riders themselves, saw things that way as well. A rivalry was starting to grow between them, nothing like the Coppi–Bartali competition of years past, but the two riders waged a serious fight for the affection of the fans. The stage nine Pisa time trial didn’t clarify things much. Track pursuiting ace and time trial specialist Knut Knudsen won the stage with Moser second, a minute slower. But Quasimodo Pollentier tortured his bike into a fabulous performance and lost only 6 seconds to Moser. Pollentier managed to hook up with Wilmo Francioni and a trio of Spanish riders in the Ligurian hills without dragging Moser along. Stage twelve’s result was a 22-second gap between Pollentier and Moser and a doping positive for the stage winner Miguel-María Lasa. The stages taking the Giro to the Dolomites were for the fast men and when the race arrived at Conegliano for stage seventeen, the General Classification was unchanged. Stage seventeen went up into nosebleed country with the Rolle, Pordoi, Falzarego and Drusciè passes. Baronchelli had a crisis on the Falzarego and ended up losing two minutes. De Muynck crashed yet again and was now down more than twelve minutes. Pollentier pulled off his coup when he and Moser gregario Mario Beccia (who was supposed to be riding with his captain, not buccaneering in search of stage wins, especially with his man narrowly holding first place) beat Moser into Cortina by 25 seconds, making Pollentier the maglia rosa by three seconds. Moser was beside himself with rage over the narrow loss and nearly got into a fistfight with Beccia that evening. Driessens tried to smooth him over and told him not to worry, that Pollentier was not really an active combatant in the race. I wonder if he also told Moser the check was in the mail and that he would still respect him in the morning. Baronchelli in difficulty. I think that's Ronny de Witte on his wheel. Stage eighteen had six Dolomite passes: Valparola, Gardena, Sella, Costalunga, Mendola with the finish atop Campo Carlo Magno. Baronchelli and Pollentier made common cause, extracting another 85 seconds from Moser, increasing the Flandria ad hoc captain’s lead to 1 minute 28 seconds. Moser was a fabulously talented rider, but was a big man, a severe handicap when it came to dealing with the real climbers in the high mountains. Pollentier’s margin still needed to withstand two serious tests, the first being the final Dolomite stage: the nineteenth leg going over the Tonale, Presolana and Zambla passes on the way to its finish in San Pellegrino. Renato Laghi, a gregario who had labored for eleven years without a single professional victory, took off on a long solo flyer and after riding alone for 185 of the stage’s 205 kilometers, arrived at the finish a minute and a half ahead of Giambattista Baronchelli’s brother Gaetano, while Pollentier carved out another half-minute from Moser’s flesh. This would be good insurance against Moser’s fearsome reputation as a time-trialist with the penultimate stage being a 29-kilometer time trial, Pollentier’s second test. Pollentier surprised the pundits by winning the stage, riding 30 seconds faster than Moser. 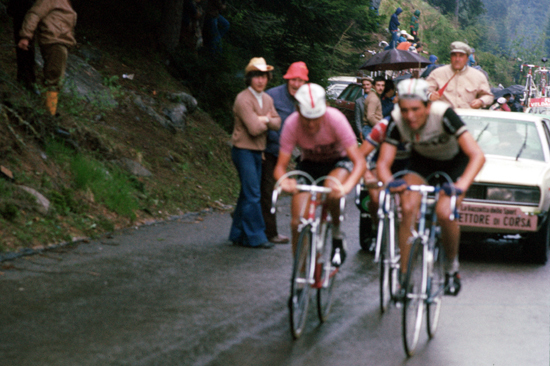 And that was the 1977 Giro; like 1975, won by a rider no one had considered a potential winner. Pollentier’s amazing 1977 kept rolling along. Seemingly unstoppable, that spring and summer he also won the Tour of Switzerland and the Belgian Road Championship. In 1978 he took the Dauphiné Libéré and a second Belgian Championship (Merckx could do it only once). In the Tour he became the Yellow Jersey after a brilliant solo victory atop l’Alpe d’Huez, but that evening he was caught trying to cheat the dope controls and was sent packing. Of course, after l’Alpe d’Huez, the Italians wondered out loud if Pollentier had been able to beat the doping controls in the 1977 Giro. Maybe. But given the ubiquity of doping in professional cycling, it hardly mattered. Pollentier still had some good kilometers left in him. He won the 1980 Tour of Flanders and was second in the 1982 Vuelta, but the man who came seemingly out of nowhere to seize the 1977 Giro was long gone. That September Moser won the World Road Championship in San Cristobal, Colombia.